The outside of the top leaf of this compendium is engraved with the main cardinal points, the characteristics of the main winds and their effects on health. The spelling is unusual and not consistent, but it has to be kept in mind that there was no standard spelling for German at the time. 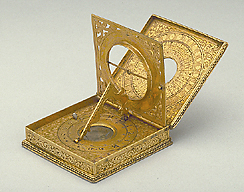 A table listing the differences between solar and lunar times is engraved on the inside, and the triangular folding gnomon of a horizontal dial for latitude 48?25' is held down by means of a silver catch in the form of a hand.